In2science has been awarded a Student Mentoring Program grant as part of a $1 million commitment from the Victorian Government. The grant is to develop new or existing mentoring programs for students from disadvantaged backgrounds; with the aim to promote school connectedness, engagement and aspirations for disadvantaged children and young people. The eMentoring program inspires, motivates and mentors regional and rural students’ interested in STEM skills and opportunities beyond year 12. Mentors and school students meet digitally once a week for 30-40 minutes over a 10 week block and discuss their common interests in science and mathematics, share their study experiences, and explore opportunities for pursuing science and mathematics at university and beyond. I went to a regional school so I’ve had experience with how hard it is for kids to connect. Where I was, in particular, we had next to no external resources for science, so I love what In2science brings to the schools. I want them to know not to give up if it’s challenging or hard – because the reward and satisfaction you get at understanding something and getting it right is the best part. The innovative online platform, specifically designed for the In2science program, connects secondary students across regional Victoria with volunteer eMentors studying STEM at university. eMentoring was piloted by In2science in 2016 and launched in 2017. Each year the program goes from strength to strength with new schools joining. Currently In2science has partnerships with 19 regional and rural schools across Victoria. The program has the potential to really change the lives of young people. L-R In2science Project Officer Rachael McCullough, mentor Priyanka Pillai and University of Melbourne In2science Coordinator Dr Maddy Yewers. A few weeks ago, In2science had the opportunity to be a part of another great community event aimed at raising the profile and support available of girls in STEM. The event was run by the Capital City LLEN and hosted by Engineers Australia in their Melbourne office on Bourke Street. High school students, parents, and teachers alike all came along to hear from women currently working in STEM, as well as organisations committed to improving gender equity at all stages on the pipeline from school to university to the workplace, including Women in Science and Engineering, Robogals Monash, and BrainSTEM. In2science Project Officer Rachael McCullough spoke on behalf of In2science about In2science’s aim to ensure that students of all backgrounds have the opportunity to be engaged by science and its practical applications. The importance of mentoring was highlighted by other speakers throughout the evening, and further emphasised by current In2science mentor, Priyanka Pillai. Currently a postgraduate science student at the University of Melbourne, Priyanka shared stories from her own journey into science, as well as her experiences as a mentor with In2science. For Priyanka, it was having her own supportive role model and mentor that inspired her to become an In2science mentor. She explained that her mother saw her interest in science at a young age and encouraged her to try new things, which ultimately saw her begin a Masters of Bioinformatics at the University of Melbourne earlier this year. Priyanka encouraged the parents and teachers at the event to invest time in listening and actively suggesting new ideas for young people, especially girls, to try out. Students at the event had the opportunity to engage in a range of workshops hosted by other organisations committed to gender equity in STEM. Robogals Monash, who were also present at In2science’s Supporting Girls In STEM event in September engaged primary and secondary school students in a hands-on robotics workshop. Melbourne University’s Women in Science and Engineering club introduced students to some lesser-known female role models in STEM, as well as passing on tips about how to be successful in their STEM studies. As long as there is a gender gap in education and workplaces in Science, Technology, Engineering and Mathematics, we are all responsible for improving our understanding of the barriers that exist for women in STEM, and committing to action that will help break them down. In2science is proud to be part of initiatives such as the City LLEN and Engineers Australia Girls in STEM event, and look forward to contributing to more in the future. In2science mentor Victoria Munro leads an activity for secondary students the University of Melbourne. In2science mentors hosted 75 students in years 8 and 9 from Footscray City College at The University of Melbourne and Science Gallery Melbourne. There, they took part in an interactive demonstration on the chemistry of fingerprints, then moved on for a tour of The University and Science Gallery’s Blood Exhibition. A big thanks to Bachelor of Science student, Victoria Munro who mentored at Footscray City College in semester 2 2017. Victoria took real pride in sharing her experiences in the Chemistry lab and showing the students her favourite places around campus, including the Science Gallery. Students from Footscray City College learning about the chemistry of fingerprint analysis. On a balmy November evening, more than 100 guests from universities, schools, government and industry gathered to celebrate the achievements of university student mentors, secondary teachers and their students in STEM engagement. The 2017 In2science Awards, hosted at Melbourne Museum, highlighted the achievements of university student mentors, secondary teachers and students in connecting science and maths in the classroom to the real world and highlight pathways university courses. The evening commenced with a welcome form In2science Director Megan Mundy and a special preview of a video looking at the placement of Yianna Phaedonos at Copperfield College. In2Science Chair The Hon Professor John Brumby AO. Advisory Board Chairman, The Hon. Professor John Brumby AO welcomed attendees and distinguished guests, including the Honourable Judith Graley, Parliamentary Secretary for Education. He spoke of the achievements of the In2science program in 2017, from the time generously given by university students in classrooms and the teachers who support them. He highlighted sheer number of people who have been involved since the beginning of the program in 2004, with 140 schools involved, nearly 2000 mentors, supporting more than 59,000 students. Professor Brumby also made mention of the positive findings of the independent evaluation undertaken by ACER earlier in the year. Professor Brumby presented the Mentor Support Award to Loan Luong-Nguyen of Westall Secondary College her exceptional support of the several mentors she hosted. The School Engagement Award was given to Galen Catholic College. The Outstanding Mentee Award went to year 9 maths student Jack Esho at Roxburgh College. eMentoring student Jake Aronleigh shares his experiences. eMentoring mentee and award finalist, Jake Aronleigh, a student of the Distance Education Centre Victoria, delivered a delightful reflection on his experiences with his Swinburne University of Technology eMentor Wael Farah, recounting all of the exciting things he had learned about astrophysics and his inspiration to pursue his interest in STEM further. The Mentoring awards followed, with Hasti Zamanian of La Trobe University winning the Role Model Award for her support of students at Templestowe College by sharing her experiences of university life and encouraging them to begin imagining their future education pathways. 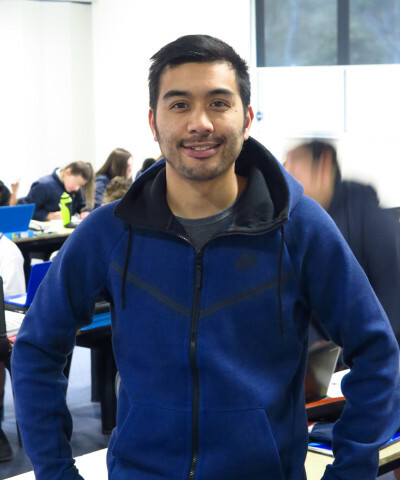 The winner of the Impact Award was Reza Aliakbari from RMIT University, who developed a great rapport with his mentees at Brunswick Secondary College and contributed significantly to the learning environment. Anna Drayton from the University of Melbourne was presented with the Dedication Award for not only being an excellent mentor to her year 9 science class at Hume Central Secondary College, but also volunteering to assist the school’s lunchtime robotics club despite no prior experience with coding or robotics. The winner of the Above and Beyond Award award went to Margaret Ngugi from Swinburne University of Technology, who showed exemplary initiative for taking on numerous professional development opportunities offered by the In2science program, and for acquiring new skills in robotics and coding to support her mentees learning with Nao robots at Bayswater Secondary College. The eMentoring award went to Sarah Hegarty of Swinburne University of Technology, who was specifically selected for her three mentees who had a particular interest in astrophysics. L-R Teacher Loan Luong-Nguyen, La Trobe University mentor Hasti Zamanian, The Hon Professor John Brumby AO, In2Science Director Megan Mundy, Parliamentary Secretary for Education The Hon Judith Graley MP, Swinburne eMentor Sarah Hegarty, University of Melbourne mentor Anna Drayton and RMIT mentor Reza Aliakbari. Anna Drayton returned to the stage to speak about her experiences as a mentor, during which she described sparking the student’s curiosity for her chosen study of neuroscience as ‘lighting a fire in them’, as she was met with a barrage of questions during a practical lesson involving sheep brain dissection. She was also able to share with students the sensation of being unfamiliar with a new area of knowledge and helping the students deal with the initial discomfort of developing new knowledge when she joined the lunchtime robotics class. Anna reflected on her opportunities to chat to students about what being a university student is like, and the amazing array of career possibilities opened up at univeristy that the students may not yet be aware of in secondary school. Following the formal proceedings, the attendees enjoyed time to socialise and network together. The event highlighted the wonderful impact in STEM engagement achieved by mentors during the year with the support of the excellent teachers that hosted them. All of the team at In2science is grateful of the commitment of everyone involved, and the achievements of 2017 set the scene for an even greater 2018. Click here to read more about the 2017 In2science Award finalists and winners. Click here to see a photo gallery of the 2017 In2science Awards. eMentoring secondary students from Traralgon Secondary College and the Distance Education Centre Victoria (DECV) were treated to a behind the scenes guided tour of the inner workings of the Centre for Astrophysics & Supercomputing at Swinburne University of Technology during the September school holiday. eMentors Sarah Hegarty and Wael Farah, both completing PhDs in astrophysics, hosted three students from Traralgon Secondary College and two from DECV, who had made the trip to Swinburne’s Hawthorn campus for the day. Sarah gave the students an insight into her PhD work of taking huge volumes of data collected from radio telescopes and finding ways to visualise it. She demonstrated to the students the computer code and software she had developed to analyse her data and probe it for insights into the mysteries of the universe. Wael then led the group across campus to his office where he works on Fast Radio Bursts (FRBs) and explained how he is developing a machine learning system to help solve the problem of extremely short cosmic radio signals being drowned out by radio noise generated on Earth. The students also had a sneak peak at the virtual reality experiences under development at OzGrav, the Australian Centre of Excellence for Gravitational Wave Discovery. Finally the students enjoyed a journey around the solar system in Swinburne’s 3D Astro Tour theatre. The day was a fantastic opportunity for students from regional areas to gain a first hand insight into life at university and real scientific research. It was a demonstration of the level of commitment shown by eMentors like Sarah and Wael and their willingness to go above and beyond to inspire their mentees. Swinburne University of Technology eMentors Wael Farah (2nd from left), Sarah Hegarty (far right), Swinburne In2science Coordinator Artem Bourov with students from Traralgon Secondary College and Distance Education Centre Victoria. In2science eMentoring Coordinator Robyn Gamble (left) and Program Manager Joanna Oreo (right) accept the nomination for the Regional Development Victoria Leadership and Innovation Award from Bank of Melbourne CEO Michelle Winzer. Credit: Victorian Regional Achievement Community Awards. The In2science eMentoring program received a nomination for the prestigious Regional Development Victoria Leadership and Innovation Award at the recent Regional Achievement and Community Awards. The nomination was presented by Bank of Melbourne CEO Michelle Winzer at a gala event held in Flemington on October 13th 2017. In2science eMentoring was recognised as the first successful online STEM mentoring program for regional Victoria. During the 10-week program, secondary students cover a range of topics with volunteer eMentors from La Trobe, RMIT, Swinburne and Melbourne Universities over an interactive platform, and take a virtual tour of their universities. This recognition was a significant acknowledgement of the success of the eMentoring program, which was among 220 nominations received from across Victoria. Read more about the latest successes of the In2science eMentoring program here.